DAY 11 ICELAND: We saw the Aurora!!! 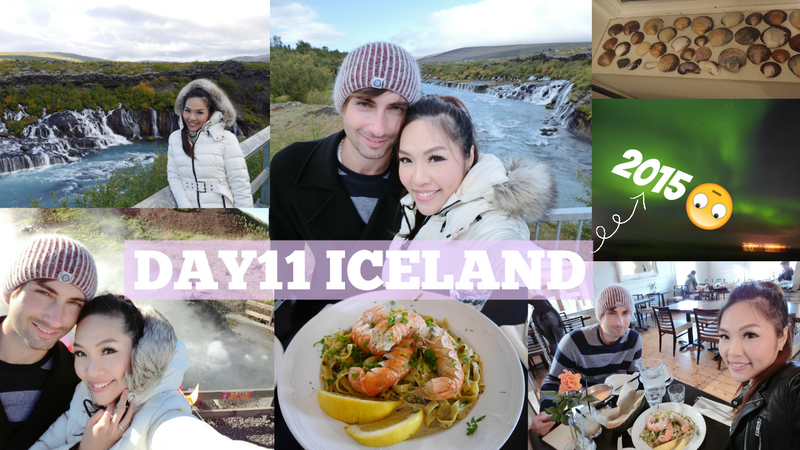 Iceland blog is back!!! XD" I can't believe this trip was in Sep 2015, almost 2 years ago! And I still didn't finish to edit it! And I want to complete memories of this trip! So here we are! This was the day before leaving Iceland. We were unwilling to leave, loved the nature, quiet and adventurous life. We really miss Iceland. We would like to go there again. On that day, we were driving back to the capital of Iceland. We visited a beautiful waterfall, the biggest hot spring along the way and we had a lunch in a restaurant, shopping in the city and saw the Aurora!!! This is definiely a highlight of this trip! We were so excited and glad to see the Aurora on the late night in Iceland! We were not expecting to see it!! But unfortunately we didn't know how to take photos of it, we didn't take any nice pictures of the Aurora! And it's impossible to film a video of this too! Anyway, we had so much fun and special moments in Iceland. Before seeing the waterfall, we saw some horses and cows along the way. The horses are a bit different and smaller than the usual ones. We arrived to the waterfall, but this is just the river connecting to the waterfall. And you can see the color of the water is pretty blue! The waterfall is amazingly beautiful!!! Then we went to see the biggest natural hot spring. And these are locally grown tomatoes priced Kr 200 per pack, and it's self-service, you just need to put the money in the green box and you can take the tomatoes. I guess this hot spring water is too hot, so no one can go in to have a hot bath. We unexpectedly saw an other waterfall, we saw the board and stopped to have a look. We took the lobster pasta and the fish soup with bread, but the waitress made a mistake and gave me a lobster salad instead. Then she forgot the bread for the fish soup, and we asked her, and she brought us a bowl! She didn't seem to understand anything we said, then she nicely proposed to offer us a cake for dessert as she did many mistakes, then she forgot again but we didn't ask her for the dessert as it was kind of embarrassing. After arriving to the capital, we checked in to the hotel and went to the city. We went for shopping for souvenirs but I didn't get this one but I just think it's funny and took a pic of it. I did a shopping haul in the vlog, you can watch it if you're interested. So pretty and cute dog was waiting for his master! We went to this restaurant called Noodle Station for our dinner! Not so good but not so bad too! After dinner, we went back to the hotel and I filmed a shopping haul video, then we went out at 9:30p.m to try to see the Aurora! And we succeeded!! So excited! At the end, I want to show you what we picked in the beach in Iceland! Want to see more, check out the vlog! !